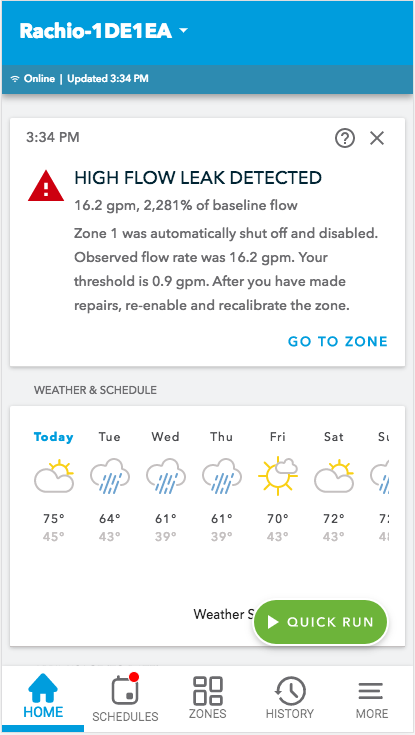 Received a leak notification from Rachio Wireless Flow Meter? To review leak notifications and what they mean, go here: Leak Notifications for Rachio Wireless Flow Meter. Looking for tips on how to troubleshoot a leak? To review possible leak causes and learn what to watch out for in your system, go here: Leak detected with Wireless Flow Meter? What to do if there's a leak.